Today’s post is inspired by a cat. A grey tabby, to be exact! Yes, my Kitty Dearest suffered a little injury to his torso last month and found himself unable to jump up onto the furniture the way he once could (shhh–don’t tell anyone we allow our cat on the furniture). What’s a kitty mama to do? I fashioned an impromptu step stool for him, of course. It’s nothing fancy–actually, it’s the small plastic bin we use to store his cat food. What was supposed to be an extra feature in the living room for no more than a few days has turned into a permanent stepping stool for our Little Mister. And it’s not nearly as cute as he is! 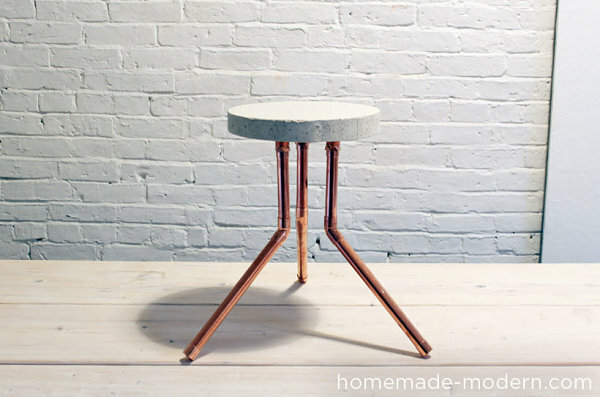 I’m in need of a stylish stool ASAP! 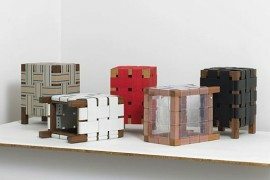 And I thought this might be a great opportunity for a DIY project, so I’m on the hunt for some good ideas. But alas, today’s post isn’t just about me and Kitty Dearest! 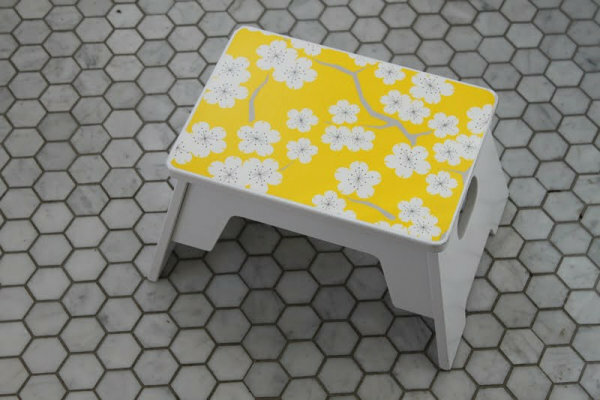 I’ve included a variety of DIY stool projects below, from the kind you sit on to the stools that are intended for holding up your weary feet while you lounge in a nearby chair. 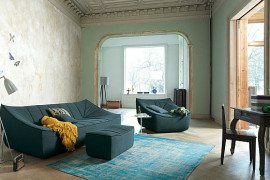 If you’re looking to add comfort (and extra seating) to your interior, why not add style as well? Happy crafting! Anyone else notice that concrete has experienced a major revival in recent years? And why shouldn’t it?! 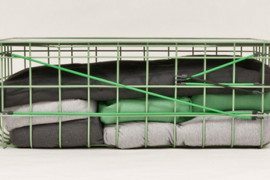 It’s cheap, and the DIY possibilities are endless. 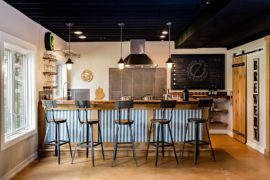 In fact, the popularity of concrete has mirrored the popularity of DIY projects in general, and people are definitely getting more adventurous in how they use this super-accessible material. 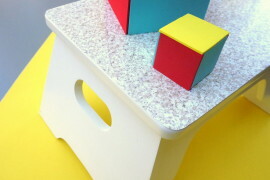 This DIY Concrete Stool from Feel Desain can be made with minimal supplies, such as a bucket, concrete, and a wooden dowel cut into three pieces. Dip-dyeing the legs adds a special touch! 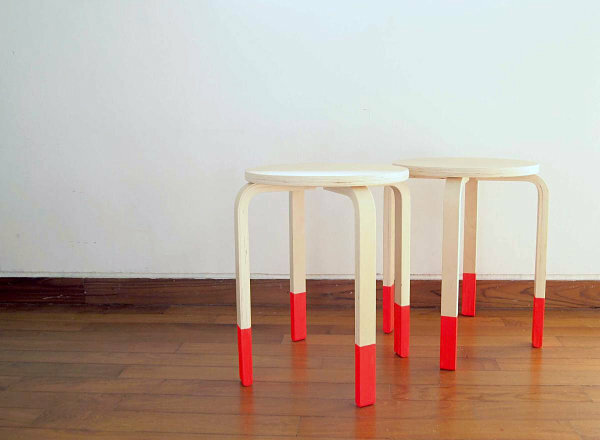 On that note, we now move from footstools to bar stools–of the painted variety! Folks, there are plenty of affordable wooden stools at the ready. 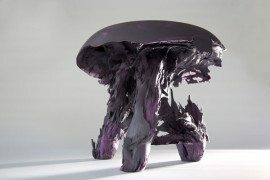 What takes them to another level can be a simple gesture, such as adding a coat of paint. The trio of custom-painted stools below illustrates this point to colorful perfection. 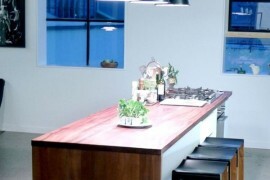 The stool of choice: FROSTA by IKEA. $14.99, plus the cost of paint. Not bad! Check out all the details at Junkee. Try getting playful with your painting techniques by experimenting with a popular look, such as the dip-dyed effect. 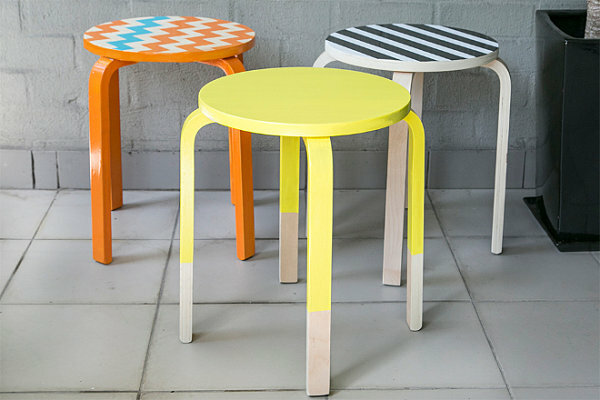 This Neon Dip Dye Stool also makes good use of IKEA’s FROSTA stool. 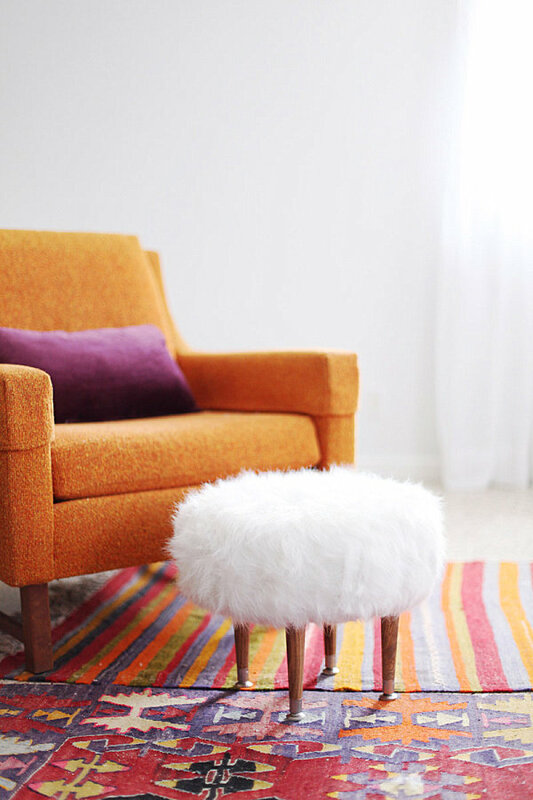 For the full DIY, head on over to The Curious Blog. Sometimes a DIY project involves a little more than a fresh coat of paint. 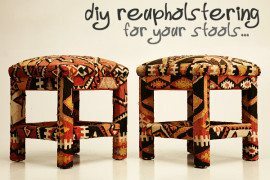 If you’re willing to roll up your sleeves and dabble in the reupholstery realm, your patience will truly pay off! 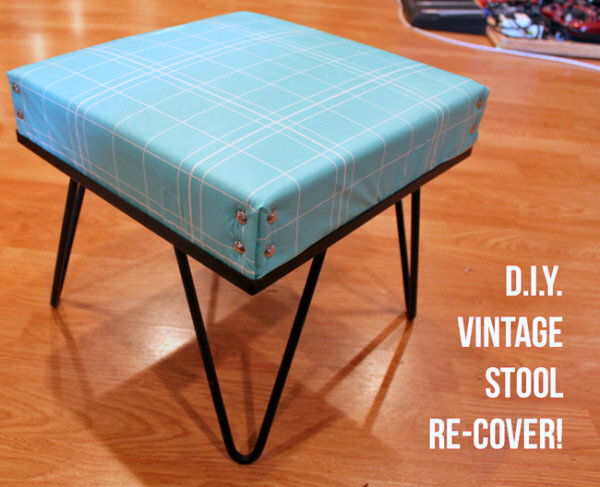 This DIY Vintage Stool Re-Cover from Betties N Brimstone is pulled off with the help of a vintage footstool and a vinyl tablecloth. Why not ensure that your upholstery is easy to clean?! 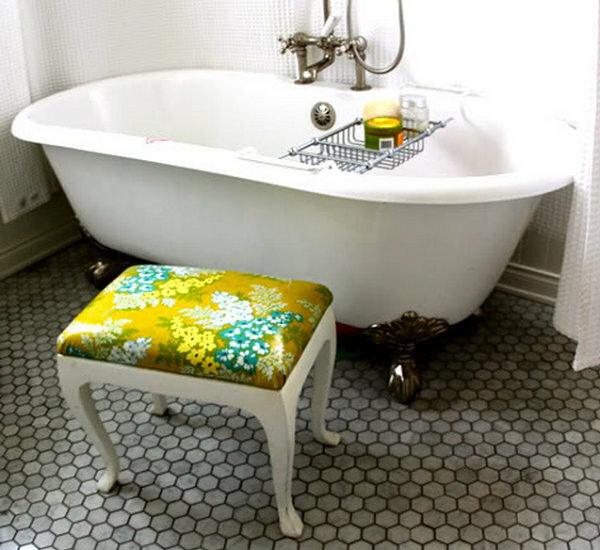 How stunning is this DIY Oil Cloth Bath Seat?! 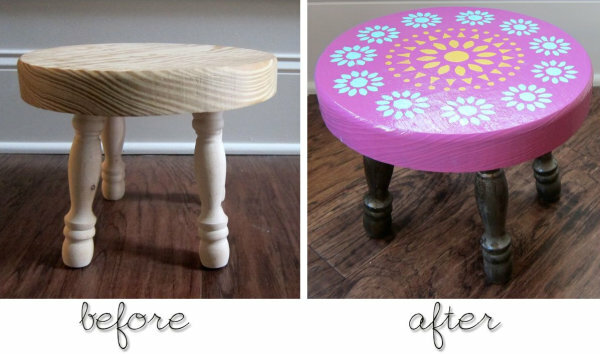 Another fabulous project idea from Pretty Prudent, this DIY illustrates how a $10 thrift store stool can be transformed into the conversation piece of your powder room, especially when the right oil cloth is involved! 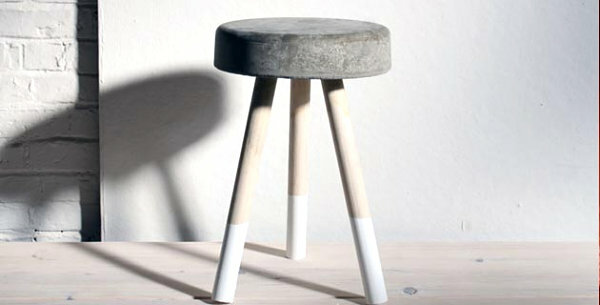 Craft your own stool from concrete. Reupholster or repaint a thrift store find. 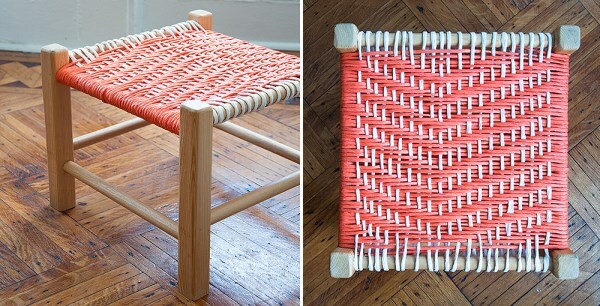 Weave a seat from paper cord. The possibilities are endless! I’m leaning toward painting an affordable wooden stool and embellishing the top with patterned shelf liner. 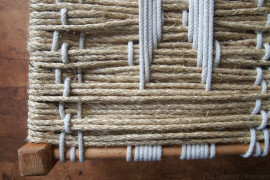 If I pull it off, I just might share the results here on Decoist!